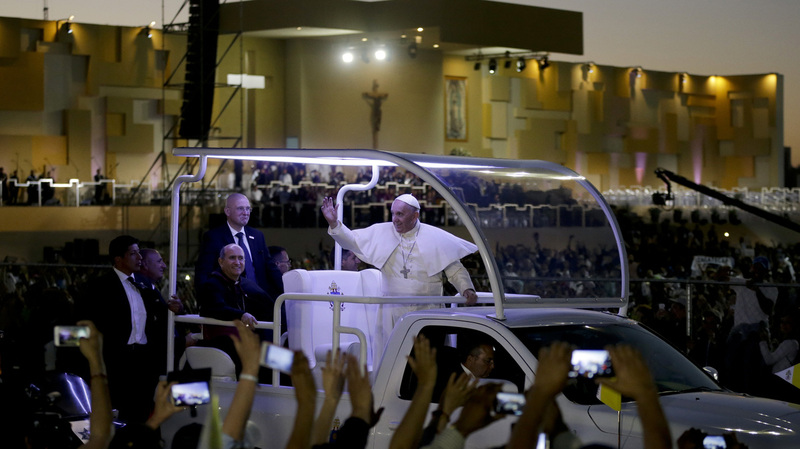 5 Memorable Scenes From Pope Francis' Tour Of Mexico : The Two-Way The pope took politicians and clergy to task, saying they were not making it their priority to ease the sufferings of the people. He also apologized for past abuse of indigenous people by the church. Pope Francis waves from his popemobile in Juarez, Mexico, where he celebrated an outdoor Mass on Wednesday. In the run-up to his visit to Mexico, Pope Francis promised a clear moral message. He wasn't coming to gloss over the current ills of corruption and drug violence facing the country. Here are five memorable scenes in the pontiff's five-city tour, and some excerpts from his remarks. Despite being the world's second-largest Catholic country, for most of the 20th century, Mexico had a tense relationship with the Vatican. Diplomatic relations were restored in 1992, but it is very rare to see a Mexican politician openly display his Catholicism. Now, not only was Francis given a state welcome in the majestic National Palace where President Enrique Pena Nieto saluted the Vatican flag, but Pena Nieto later took Holy Communion on live TV. The more cynical in Mexico point to the president's plummeting popularity as incentive for him to post as many selfies with the pope as he could. At that speech in the National Palace, despite being surrounded by Mexico's political elite, the pontiff didn't hold back. Mexico needs honest and upright leaders concerned about the many instead of the few, he said. "Experience shows us that whenever we seek the path of privilege or the benefit of a few to the detriment of the common good, sooner or later life in society becomes a fertile ground for corruption, drug trafficking, exclusion of different cultures, violence and even human trafficking, kidnapping and death, causing suffering and hampering development." The pope left the National Palace and walked into the Metropolitan Cathedral to give an equal dose of tough love to Mexico's clergy. Offering only tepid applause, the assembled cardinals and bishops listened to the pope's admonishments. The speech did much to bolster critics who say the church hierarchy caters more to the rich and political powerful instead of the masses suffering the violence of the drug trade. The pope urged Mexico's clergy to "embrace the fringes of human existence in the ravaged areas of our cities." "Do not allow yourselves to be corrupted by trivial materialism or by the seductive illusion of underhanded agreements. Do not place your faith in the chariots and horses of today's Pharaohs, for our strength is in the pillar of fire which divides the sea in two, without much fanfare." In a spectacular visit, not just historically but also visually, the pope celebrated Mass with tens of thousands of indigenous people dressed in stunning traditional clothes. He authorized the use of indigenous languages in official celebrations and he apologized for centuries of abuse and discrimination suffered at the hand of the church. "Some have considered your values, culture and traditions to be inferior. Others, intoxicated by power, money and market trends, have stolen your lands or contaminated them. Forgive me. Today's world, ravaged as it is by a throwaway culture, needs you!" Despite claims by Republican presidential candidate Donald Trump that the Mexican government must have put the pope up to it, Francis celebrated Mass not far from the fence that divides Juarez, Mexico, and El Paso, Texas, and made an impassioned plea for migrants around the world. He said this tragic global phenomenon should be measured, not by numbers and statistics, but by names and stories and families, and that those running from danger should not be criminalized. "They are 'cannon fodder,' persecuted and threatened when they try to flee the spiral of violence and the hell of drugs. Then there are the many women unjustly robbed of their lives. "Let us together ask our God for the gift of conversion, the gift of tears, let us ask him to give us open hearts like the Ninevites, open to his call heard in the suffering faces of countless men and women. No more death! No more exploitation! There is still time to change, there is still a way out and a chance, time to implore the mercy of God." It was early Sunday morning and the pope sped right through my Mexico City neighborhood. So for a few seconds, folks here did what hundreds of thousands have done throughout his visit to Mexico — screamed and waved as he drove passed. One neighbor told me the pope couldn't have picked a more perfect time to come. The 60-year-old housewife said, "With all the problems we are having now, all the corruption and violence, we really need him and his faith."